Mol’s Place is both a contemporary exhibition space and the home of collector and patron of the arts, Mr. Jan Mol; and The Art Party on 23rd March was the first in a planned series of events organised by the gallery to promote the work of a number of emerging artists and encourage fresh creative endeavour. 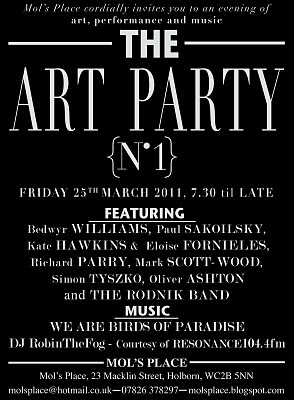 As well as exhibiting a host of artists working in such diverse disciplines as painting, sculpture and kaleidoscope, the evening also featured performances from awesome band We Are Birds of Paradise, the extremely bizarre Rodnik band and myself in my capacity of official Art Party DJ, which was really rather an honour. Here’s a short extract from a set that if memory serves me correctly spanned almost three hours. It would’ve been a longer extract but the batteries ran out. The batteries on my recorder, that is. My own batteries gave out at about 4 o’clock the following morning when I finally finished tying the speaker cables back together. Thanks to Katy, Melissa and of course Mr. Mol for a splendid evening. 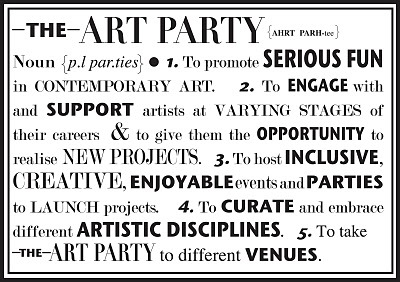 Further events are apparently in the pipeline, visit the Mol’s Place website to find out more. I am the personal website of radio producer, DJ and self-styled frustrated artist Robin The Fog. I predict many happy years of him sitting in front of me swearing copiously as I dutifully spread reams of complex HTML code all over the space where he was hoping I’d embed a media player or something. He really has no idea what he’s doing. Still, wish him luck.